All babies cry and there is a good reason for that. Babies cannot do anything for themselves and so rely on parents to provide food, warmth, comfort and entertainment. Crying is how babies let parents know that one or more of these needs is not being met. It can, of course, be upsetting for parents, particularly in the early days when they have not yet worked out what the baby wants. But rest assured that crying does not necessarily mean there is anything seriously wrong. 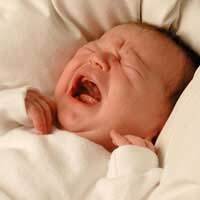 Even perfectly healthy newborn babies will cry between one and three hours every day. After a while, parents will begin to recognise their baby's different crying patterns and are able to anticipate their baby’s needs. As children grow they learn other ways of communicating - eye contact, making noises and smiling – and the need for crying is reduced. Until then, there are a variety of ways to try to comfort a crying baby. No method is foolproof, however, and it may take time to work out what is best for a particular baby. Most babies like to be rocked. Try walking around rocking the baby or sit in a rocking chair. Some babies are comforted by faster motion and drop off quickly if taken for a drive in a car. Alternatively, sucking a thumb or dummy can comfort a newborn by steadying the heart rate and relaxing the stomach. A gentle baby massage can be soothing, particularly if the baby has wind pains, so try to rub the baby’s back or stomach. Newborn babies prefer to feel snug and secure - as they were in the womb - so try wrapping the baby in a blanket. In the womb, a baby can hear the regular beat of the mother’s heart, and so many babies like being held close. Other regular, repetitive noises, such as soft music or singing a lullaby, can be calming too and even the rhythm of a washing machine has been known to lull a baby off to sleep. It can be very difficult for parents if, despite every effort, a baby continues to cry almost constantly. Most of the time, babies cry because they are hungry, uncomfortable, too hot, too cold, tired, unwell or in need of a reassuring cuddle. Sometimes the reason is not as obvious and parents may not be able to figure out what is wrong when their baby cries. If both parents are around, it can be a problem shared, but if a stay-at-home dad is left holding the baby it can be extremely stressful and worrying. Newborns can be fretful, unhappy and hard to console for a few minutes or several hours at a stretch. Inconsolable crying for hours at a time, sometimes called colic, can put a strain on the whole family and there is no magic cure. It is rare for it to last for more than three months, however, and the baby will grow out of it eventually. A househusband must remember that he is not to blame and, although it is difficult, try not to feel rejected or frustrated. To avoid being overwhelmed, take deep breaths, play some quiet music and try to relax for a few minutes, put the baby down to be left to cry out of earshot for a short while, talk to other new parents and at the local parent and baby group or to the health visitor about ways of coping, or call a relative or friend and let someone else take over for a while rather than let the frustration and despair build up. Failing that, call a helpline such as Cry-sis, a national charity that provides support for families with excessively crying, sleepless and demanding babies. It is open between 9am and 10pm seven days a week on 08451 228 669.